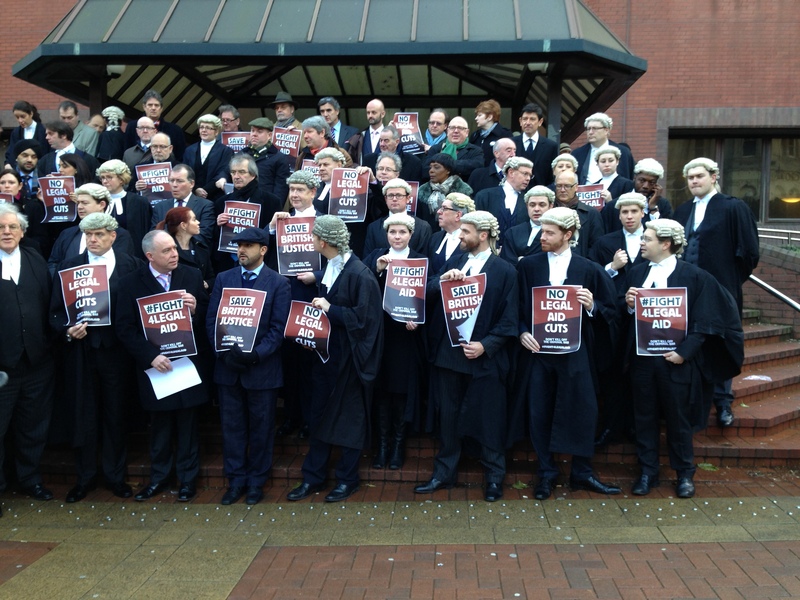 Criminal Barristers held a half day strike on Monday in protest at cuts to legal aid fees. This was the first strike in their history. In Birmingham, barristers gathered outside the Crown Court, where we joined them in solidarity and in protest at the cuts to legal aid which have already seen legal aid removed from many areas of civil law, and threatened to completely corrupt our criminal justice system until protests forced the Tories to remove the clauses which would have meant that defendents in need of legal aid would have no choice of which solicitor they can use, and the job would be awarded to the solicitor that bid the lowest for it. 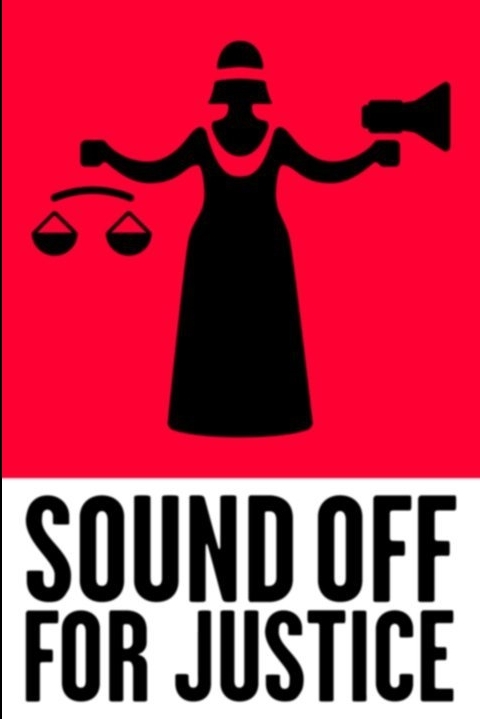 Criminal barristers are set to mount a half-day strike on Monday 6th January in protest at the cuts to legal aid. This will be the first strike in their history, and is an indication of the damage that this government are seeking to do to our justice system. Whilst the worst parts of the criminal legal aid reforms – competitive tendering and defendents having no choice of solicitor – have been removed, thanks in large part to the opposition from the legal profession, the government wants to cut fees paid for legal aid cases by 17.5%, and have already removed legal aid support from many areas of civil law. One of the common misconceptions is that legal aid is seen as a gravy train for barristers, who come from a privileged background and who all earn over £100,000 a year. In reality 60% of barristers at the criminal bar earn less than £40,000 a year. They face earning fees as low as £20 a day, once the hours of skilled preparation, time in court, tax and clerks’ fees are factored in. The CBA will assemble at 10am on Monday 6th January outside Birmingham Crown Court. The CBA message will be read at 10.30. The members will move to St Phillips Chambers for a Circuit meeting. The coalition has been mounting a campaign of destruction against our justice system. 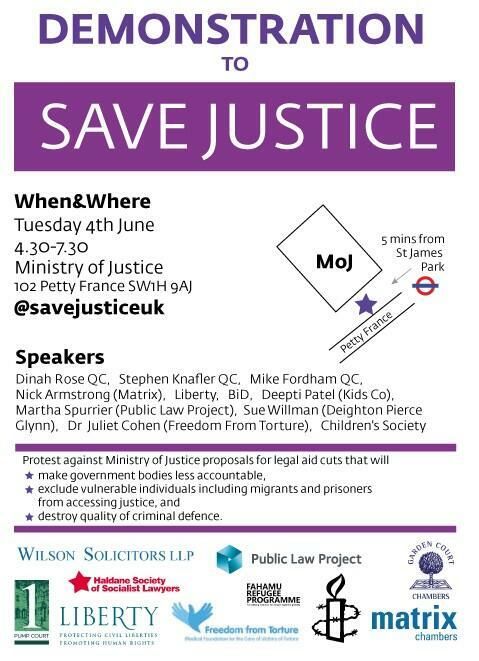 Straight up cuts to civil legal aid, cuts and reforms to the criminal legal aid system and a suggested privatised court system combine with privately run prisons and attempts to privatise large parts of policing to threaten to completely corrupt our justice system. 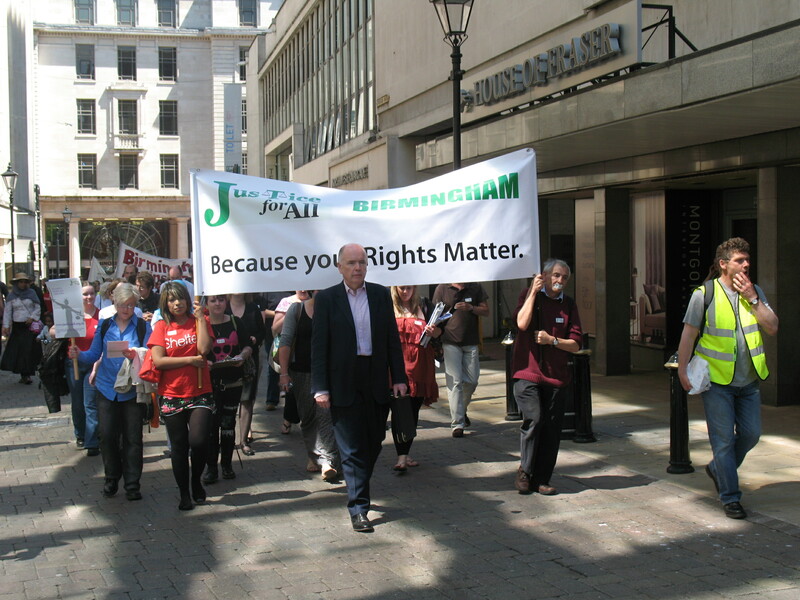 Birmingham Law Centre is facing closure after Birmingham City Council (itself facing massive cuts) refused to offer money to the law centre to replace the lost income from legal aid, which will cease to exist for many areas of civil law in April 2013, denying access to justice for anyone unable to afford solicitors. 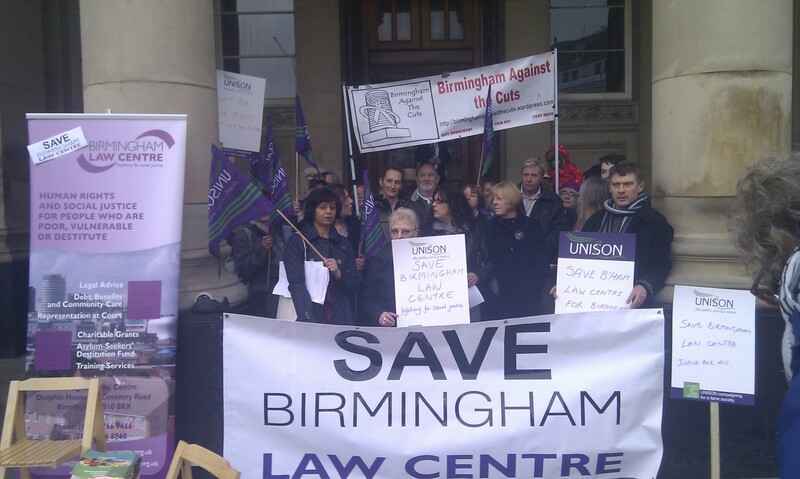 Birmingham Law Centre is facing a very bleak future and may soon have to close. As with every law centre, we are having to deal with a massive reduction to our income due to the government’s legal aid cuts. However, unlike most law centres, we receive no funding from our local authority. We’ve ju st got word that the bill is going to be fast-tracked. This means the Government is trying to avoid the debate in Parliament and with society before 725,000 people are cut out of the legal system. The bill is expected this Thursday in the House of Commons – the 2nd reading of the bill is expected on the 28th of June. We need you to get as many people as possible to join the campaign today. 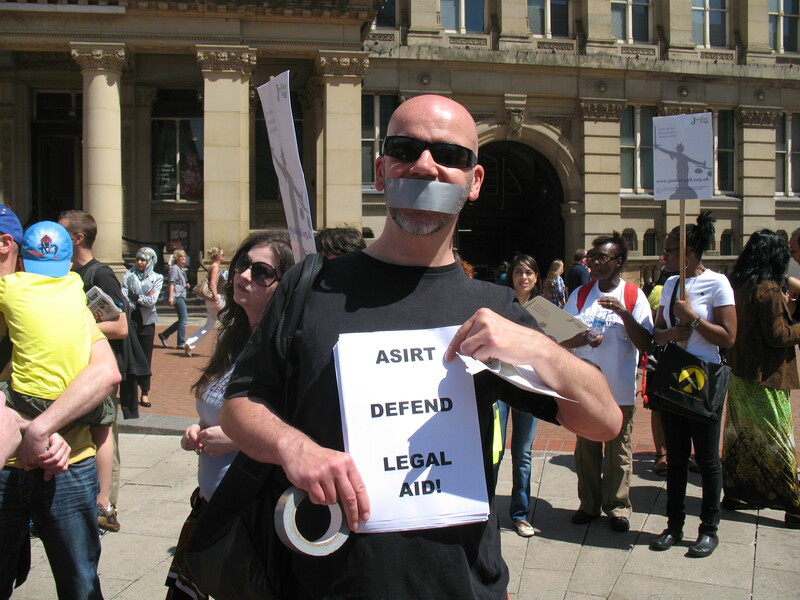 A couple of weeks ago, Justice for All (another campaign group fighting cuts to legal aid) held a national day of action, which included a demonstration and public meeting in Birmingham. At that meeting we learnt about some of the ways that £350 million of cuts to legal aid will affect people, as it removes access to justice from over 6,000 people in Birmingham, seeking legal advice on subjects such as divorce, housing and immigration. More details in the report made of that event. 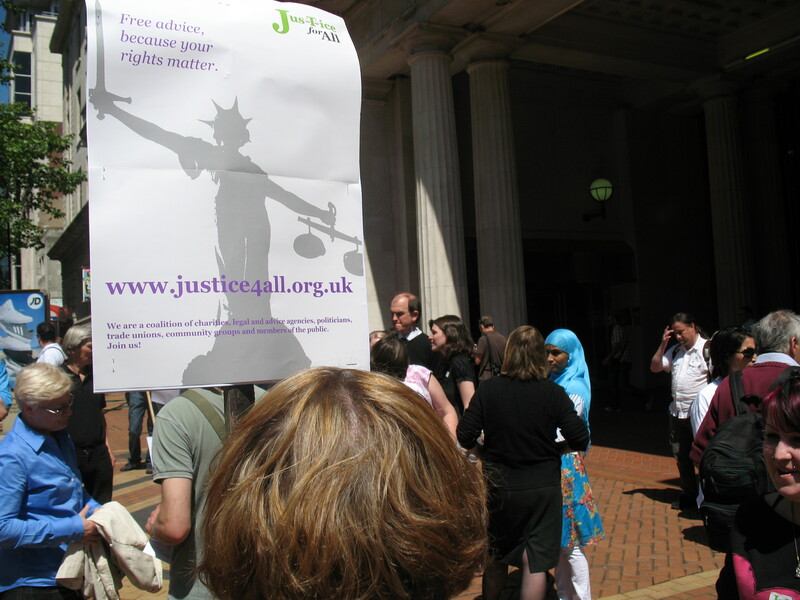 Today (3rd June) was a national day of action, called by Justice for All, to demonstrate about planned cuts to legal aid. 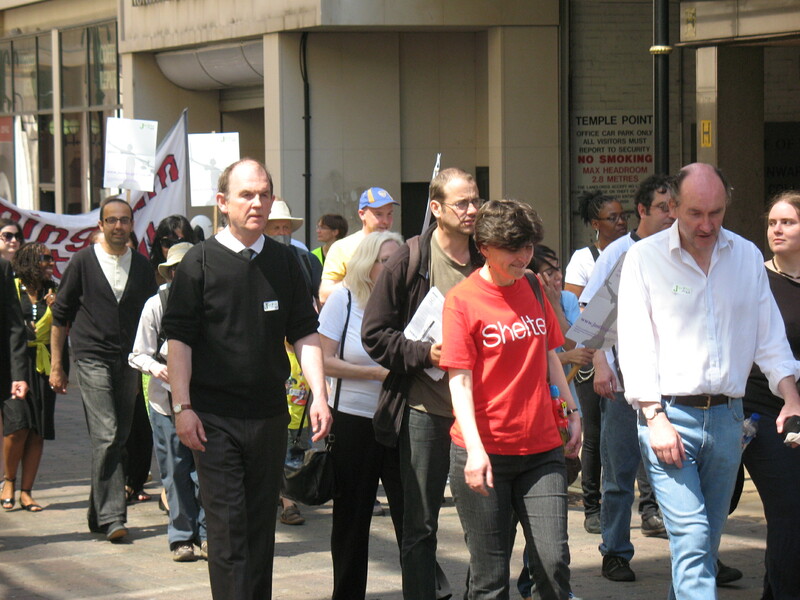 In Birmingham, around 100 people gathered outside the family law courts and marched through the city centre to a rally at the council house. The government are planning to cut £350million from the legal aid budget, by cutting or removing the right to legal aid for cases involving debts, benefits, housing, employment, education, family, immigration and clinical negligence. 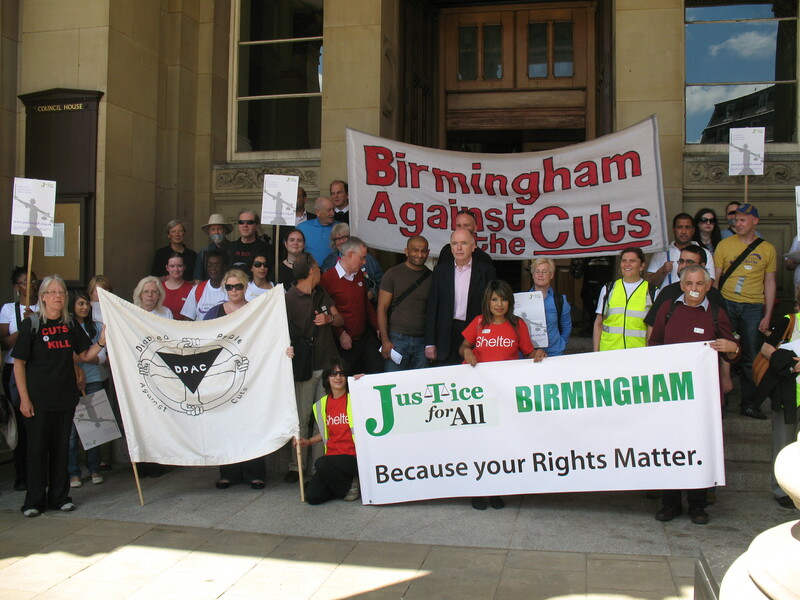 These cuts will remove access to justice from over 6,500 people in Birmingham. In addition, removing legal aid will cause a rise in costs for tribunals and appeals – it is estimated that for every £1 invested in legal aid and advice services, £10 is saved in court and tribunal costs. and spoke about the community law centre he had been involved in setting up, before he was an MP. 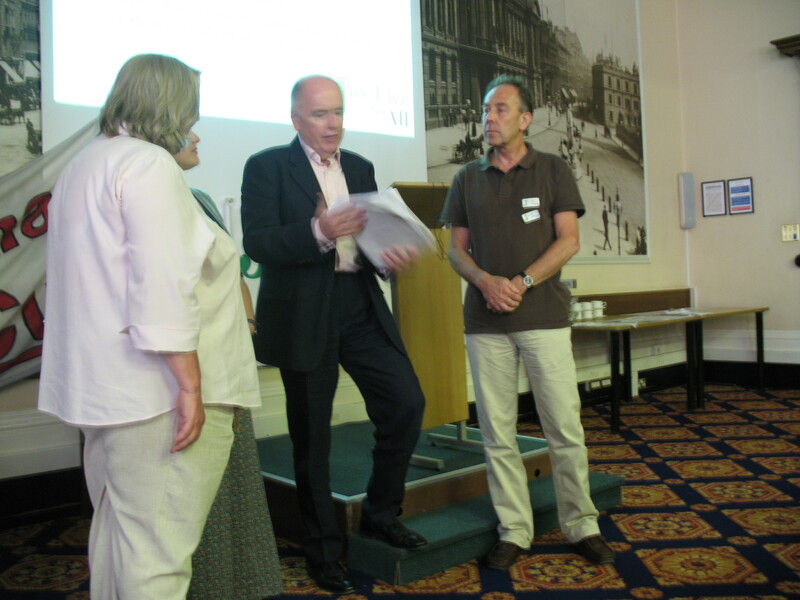 He said that for the individuals who came to them for advice, their intervention was the “difference between life and no life” and spoke passionately about the importance of legal aid and the legal advice services that it funds. Yvonne Davies, Chief Executive of CAB in Birmingham told us how the legal aid work they were involved in concerned highly complex parts of law, and spoke in detail about disability benefits, and how the CAB works with disabled people to ensure that the legal aspects of applying for benefits and appealing decisions do not prevent people from getting the benefits they need. 6,500 people come each year to CAB with complex benefit matters, and tribunals & upper tribunals deal with legal arguments using legal terms that do not mean what ordinary people might think them to. Terms like “prolonged” have specific legal meanings which the advice specialists and lawyers who work for CAB – funded by legal aid – understand. Finally, Linda Burnip from Disabled People Against the Cuts said a few words about how important legal aid was to disabled people, quoting figures that when appealing against decisions regarding Incapacity Benefit (I think – Linda if you read this and I should be saying DLA or ESA or disabilty mobility allowance or something else, please correct me), 40% of appeals were succesful, but when someone is being represented (usually by a service like CAB) this figure rises to 70%. June 30th – strike day..if you’re on facebook, follow the link for more details. Otherwise the key information is this: 12 noon, Victoria Square.. more details to come soon. 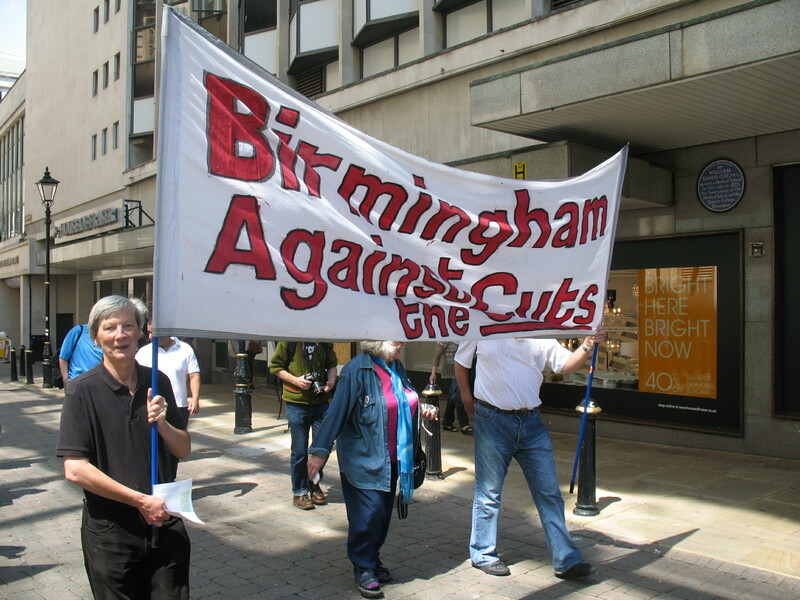 September 18th – Rage Against the Lib Dem conference.. details to come soon – this will be a huge action from groups around the west midlands – with all the anti-cuts groups in the region working together with Midlands TUC to produce a huge demonstration. We hope that you will be able to join us for both of those dates. Right now, what you can do is sign up for Justice For All’s campaign. Sign the Birmingham petition here. We will do our best to keep you informed of future events – the legal aid bill will be published next week, and following that there will be a meeting to discuss the cuts to legal aid and how to defeat the bill as it passes through parliament. The cuts to legal aid underline again the nature of this government – it is not about saving money, or reducing the deficit. This is an ideological government, committed to ideas of small state and individualism, unconcerned with the needs or problems of ordinary people – or possibly totally unaware, since this cabinet is stuffed with millionaires who have never experienced what it is like to live life on the breadline. We need to stand united against them, and to make sure that our voices are heard.Join us at future events – keep up to date with what is happening in Birmingham on our upcoming events page. The Paul Franks Show (BBC) – Emma Cook, Birmingham CAB’s Operations Manager is interviewed about the legal aid cuts – 1 hour and 36 mins in…. All the above are BBC broadcasts so I don’t know how long they will remain on iPlayer for.